From the New York Times this weekend, a great article describing New Jersey Governor Chris Christie as "six months into his term as governor: blunt, energetic, clearly enjoying himself...[a]nd having his way." Mr. Christie has turned out to be a far more deft politician than his detractors — and even some supporters — had expected, making few compromises as he pursues a broad agenda for remaking New Jersey’s free-spending political culture. So far, polls suggest, the public is giving him the benefit of the doubt. In a mostly blue state where Democrats control the Legislature, Mr. Christie, a Republican, won election last year mostly because of the deep unpopularity of his opponent, Gov. Jon S. Corzine. Mr. Christie, a former federal prosecutor known for aggression rather than deal-making, took office to predictions that his hard-charging style would not work in the labyrinth of Trenton, where factions of party, region and interest group would slow him down. So, basically,what Chris Christie has done is completely blow out of the water the standard argument that Republicans need to dilute their positions, moderate their ideas, and bend over backwards in the hope that they might be seen as bipartisan. Christie offers no apologies and takes no prisoners in his efforts to enact much-needed reforms of New Jersey's tax and spend culture. He has attacked the powerful teachers' and labor unions head on, and, incredibly, seems to be succeeding. 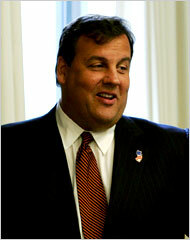 Personally, I cheer the development of elected leaders like Chris Christie. Republicans trying to be moderates gives us politicians like Arlen Specter and Charlie Crist, and disastrous legislation like Ted Kennedy's immigration reforms and the McCain-Feingold campaign finance bill (which, in my opinion, is an unconstitutional assault on the First Amendment).